The ultimate party bus experience is in a party bus from Legend! 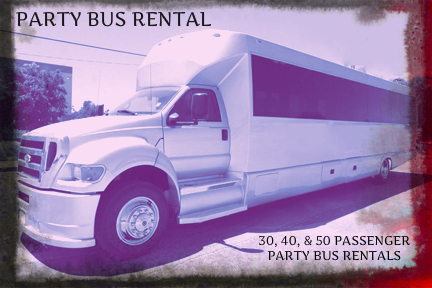 Party bus rentals for every occasion. Legend offers nationwide acces to party bus rentals for groups of 30 or more with 25-30 passenger party buses, 35-40 passenger party buses and 45-50 passenger party bus rentals in Los Angeles, San Francisco, New York, Chicago, Boston, and Miami. Our party bus rentals from New York to Boston and Houston to Chicago offer awesome lights, dance floors, leather seating, poles, and more. Legend LA party bus rentals are also available in Los Angeles, San Francisco, as well as Ventura, the OC and DC. Weddings – Shuttle your wedding party. Corporate Event – 30, 40, & 50 passenger Party Buses. Transfers – LA Party Bus to Vegas! Hollywood Nights – Party Bus to hot spots! What happens on the party bus doesn't always stay on the party bus. It's on Twitter, Facebook, & Google+ before you're even done getting stupid. That said, Party on the Bus!! !